The Laotian capital located near the border between Laos and Thailand is one of my favorite cities in Southeast Asia. Its safe and laid-back environment, at the same time intact culture is what I love most about the city. It’s a city so convenient to just walk around from places to places, which carries a heavy weight for me in choosing my favorite cities. A former French protectorate, Laos' capital city possesses some French characteristics-in some of their buildings, language, and their food. Being a communist country shut down from the outside world until the early 90's, its culture is still intact, so Laotian-and is the few cities in Asia or in the world that is not yet Americanized. A Laotian woman dressed in traditional clothes. There are no fast foods in the city-American fast foods that is. Sadly, I saw one Pizza Company restaurant in my recent visit (A Thai restaurant chain). I hope Ray Kroc's McDonalds won't find its way to this charming city. So instead of having those cholesterol-laden, void of nutrients, greasy, artificial, highly-processed, commercialized foods, what you'll have are authentic Lao cuisine, restaurants nicely built beside the Mekong River, cafe-patisseries on every corner, street food eateries, and bakeries which offer French pastries and bread. You can just relax and dine on these tasty foods at an affordable price. Freshly-baked, French-inspired Laotian baguette. Better than Subway. There's a law that prohibits multinationals in. So everywhere there are little privately owned cafes. It's a wonderful and amazing place. So finally you've found a city with no KFC/McDonalds/Starbucks or any of your hated conglomerates. Even if it’s a capital and Laos' biggest city, there is little to no traffic in the city. Its low population makes it a peaceful city. Crime rate is also low. It’s a safe city. Walking around the city is a perfect activity as you can fully experience the sights, sounds, and street foods. You can basically walk from places to places. Did I say it's a walking city? Because of those factors mentioned above, you can really have a cultural experience-a relaxing cultural experience. I've been to Vientiane 4 times already, but I still can't get enough of it. I am still planning to visit Vientiane again-a charming city devoid of western crap. 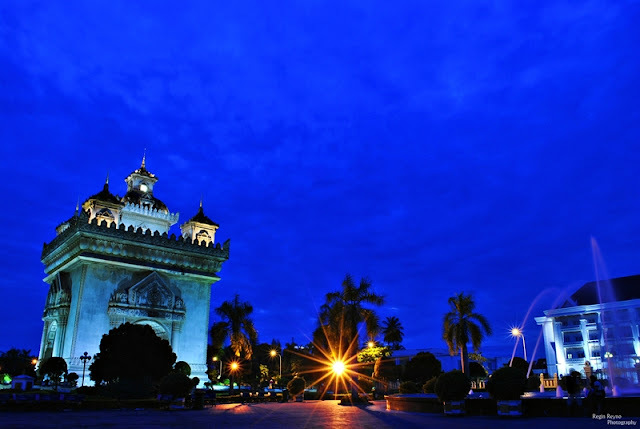 So if you want to experience an amazing culture at the same time have the conveniences of a city, visit Vientiane. 1. Shop in the night market beside the Mekong River (This place is touristy so expect for the price to be a little bit up). 2. Dine and relax in the many restaurants, cafes, bistros, beside the Mekong River. A lot of tourists hangout in this area. 3. Watch the sunset over the Mekong. 4. Try Laotian foods such as somtam Lao, sticky rice, Laotian noodles, and baguette. 5. Experience affordable Lao massage in countless massage parlors in the city. 1. Patuxai, a monument built in 1957 which resembles the Arc de Triomphe in Paris, France. 2. That Luang, A Buddhist temple and is the national symbol of Laos. 3. War Museum, to know more about Laos' history. 4. Morning Market/Talad Sao Mall, if you want to shop for souvenirs. What are your criteria in choosing your favorite city?